This is my journal of art experiments. I love to try new techniques and often end up changing them as I go or combining different ones. It is hard to remember later exactly how I did it, so this is my attempt of writting it down so I can reproduce it later or explain to someone how it was done. 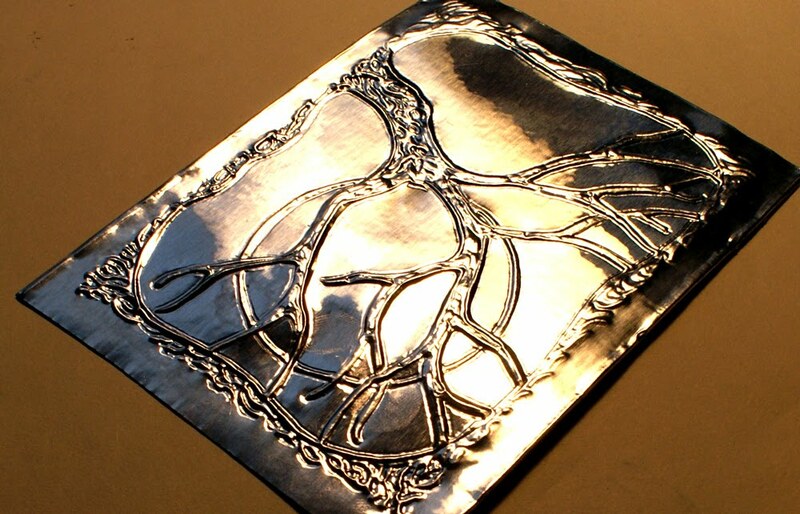 I love the look and texture of embossed metal. 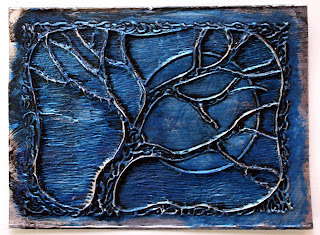 I started making these ACEOs a while back and always seem to come back to them from time to time. A few people have asked how they were made, so here are step-by-step instructions. Like anything else, it is fun to try different things, so don't be afraid to come up with your own variations... that's what makes it so much fun! 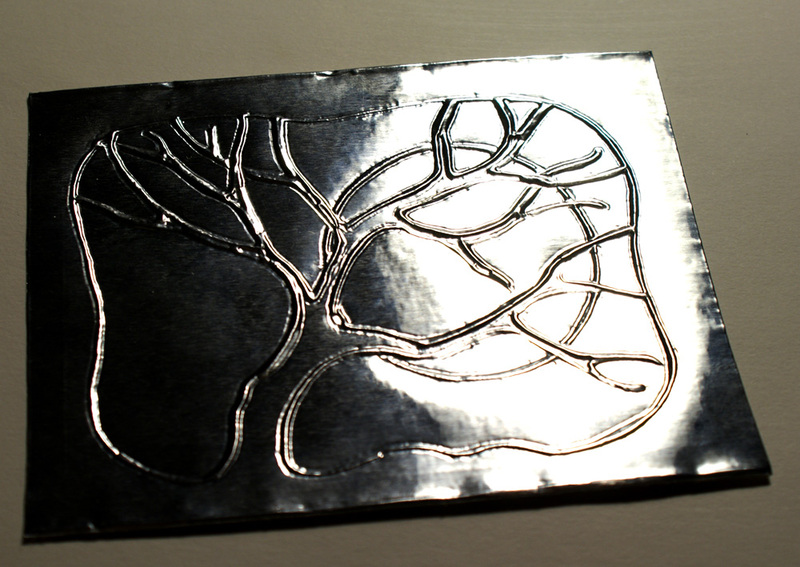 I hope you enjoy the instructions and making your own metal embossed ACEOs. 1. 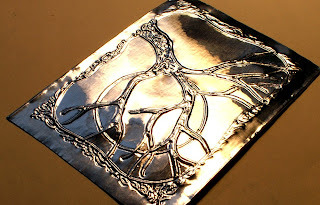 Cut metal a bit larger than 2.5"x3.5" - you want to leave a border around the ACEO so that you can fold it over and hold the paper in place - I'd say at least 1/4"
2. 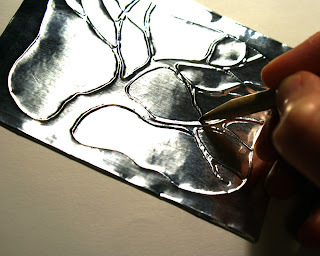 Turn it over and draw your design in the back adhesive paper if you are using metal tape, or draw on tracing paper if you are using metal sheeting. 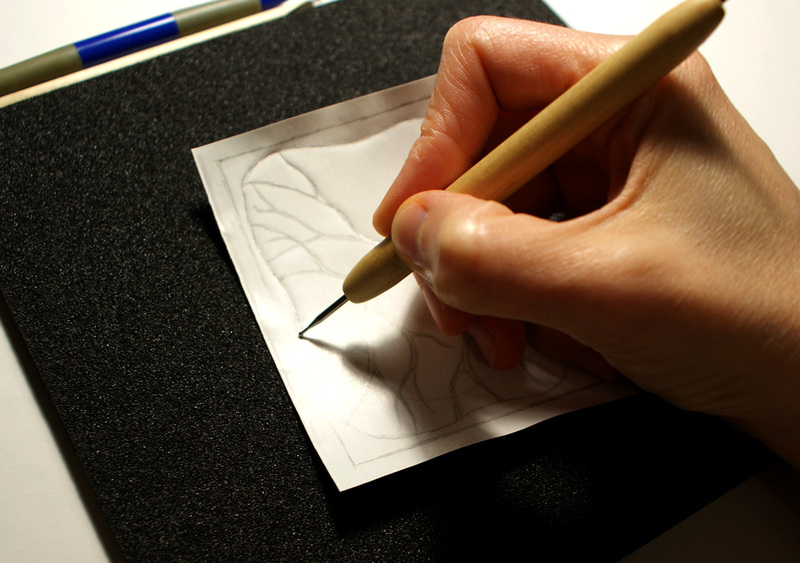 You want to have a thin but strong paper so that when you trace and put pressure on it, it won't tear completely. 3. Place the metal on the foam with the design facing you. 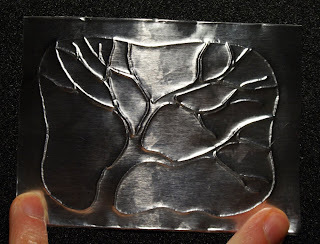 With the embossing tool, go over the lines of your design putting slight pressure, but not enough to tear your metal. 5. Place the metal on the foam again, with the back facing you. 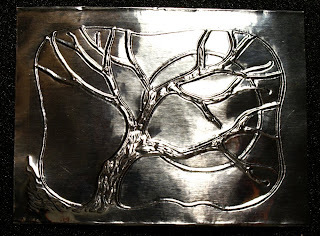 Emboss your design details. In this ACEO I embossed the tree bark and continued all around the edges. 6. 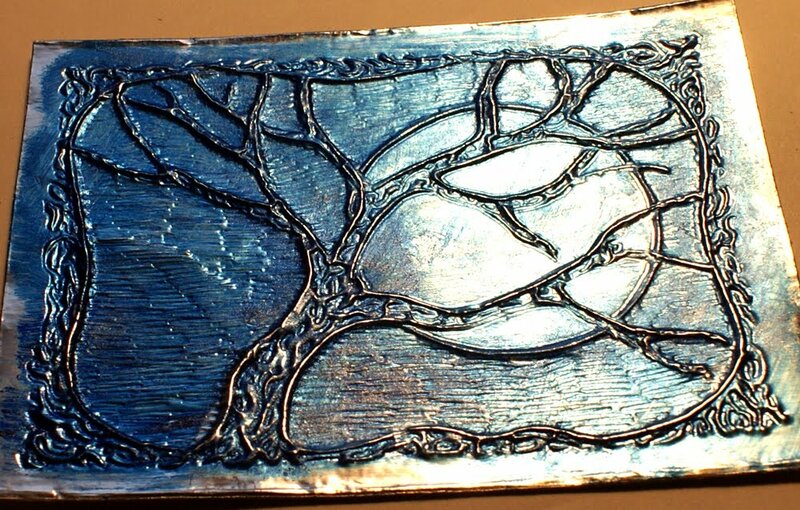 Turn over your ACEO right side up on a flat surface and go around the embossed details you just made to make them stand out more. This may be a matter of going back and forth between step 5 and 6, until you are satisfied with the results. 7. Decide on what to do with the background. 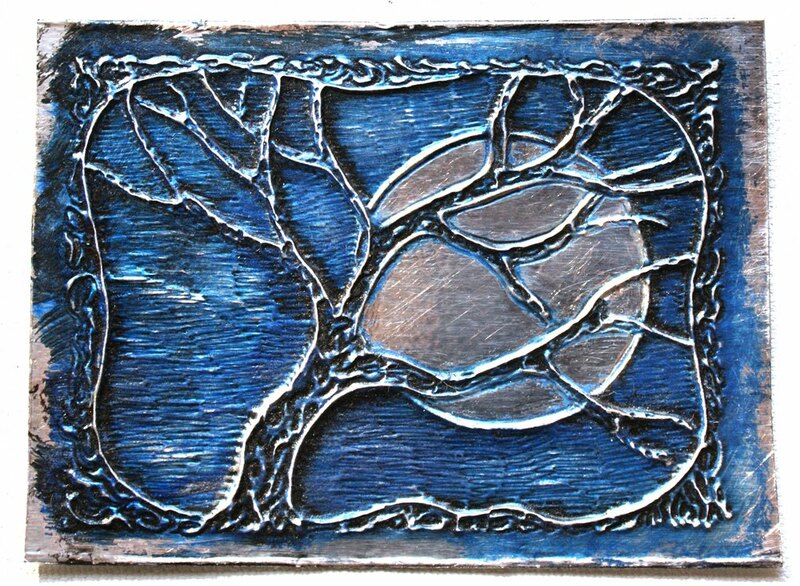 On this ACEO, I decided to leave the moon alone and do hatching on the background. 8. With the acrylic color you decided on, go over the whole ACEO. 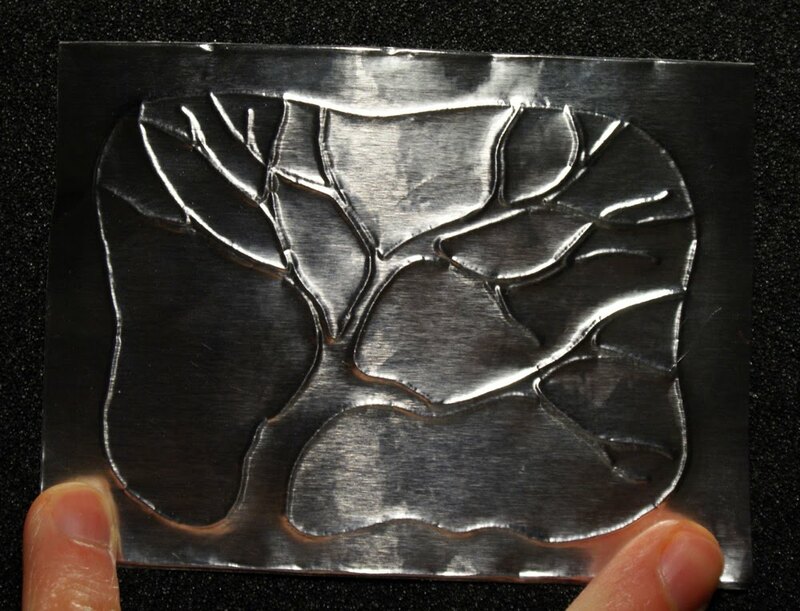 Let it dry for a minute or two and then rub off any excess - be careful when rubbing off, you don't want to do it too hard or you may damage the embossing. 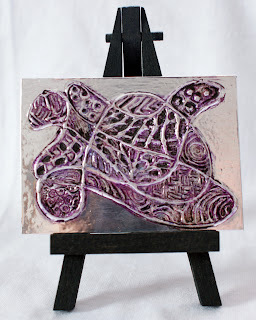 You can also use alcohol inks instead, it will give the ACEO a different look - no rubbing off needed..
10. 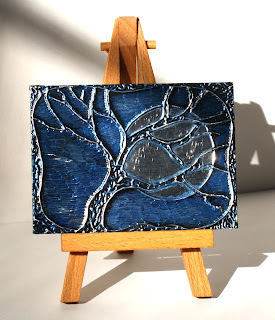 Go over the entire piece with black acrylic paint. Let dry for a minute and then rub off with a paper towel until you are satisfied with the results. Let dry. 11. Work on any other details - I clear the moon with alcohol and a Q-tip, and lightly sand over the raised areas to make them stand out more. 12. Cut each of the corners close to the edge of your ACEO - this is so it will be easier to fold the corners. 13. 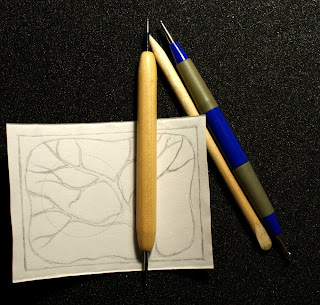 Place the ACEO on the foam, right side down. 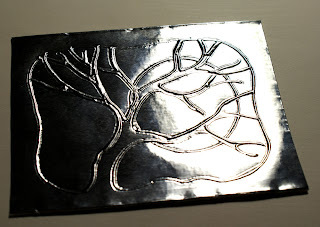 Peel off the backing paper and place the ACEO backing on your embossed metal. 14. One side at a time, gently fold the metal over the ACEO paper. 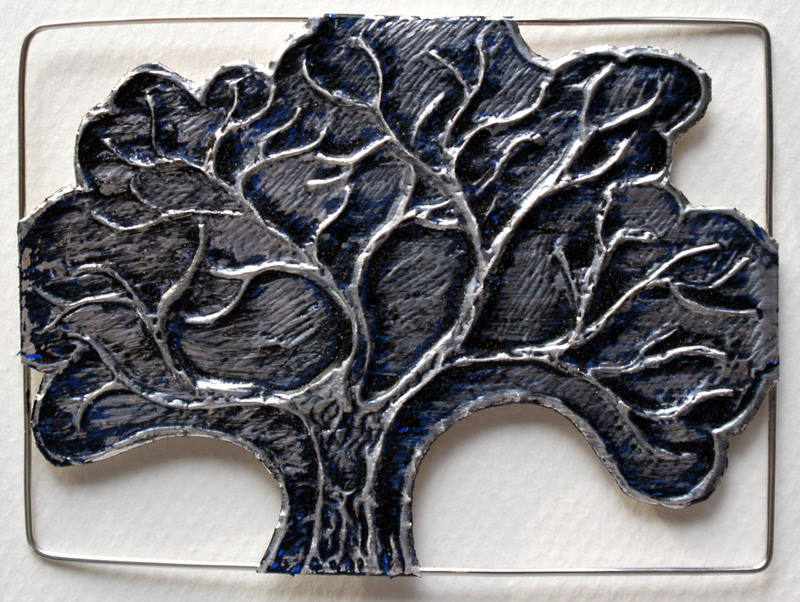 The foam is underneath, so you can put a bit of pressure, but not too much or you may lose some of the embossed detail. 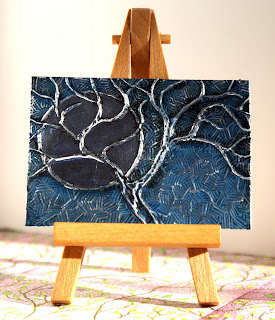 This Zentangle ACEO was painted with alcohol inks, then the background cleared so the zentangle would stand out more. 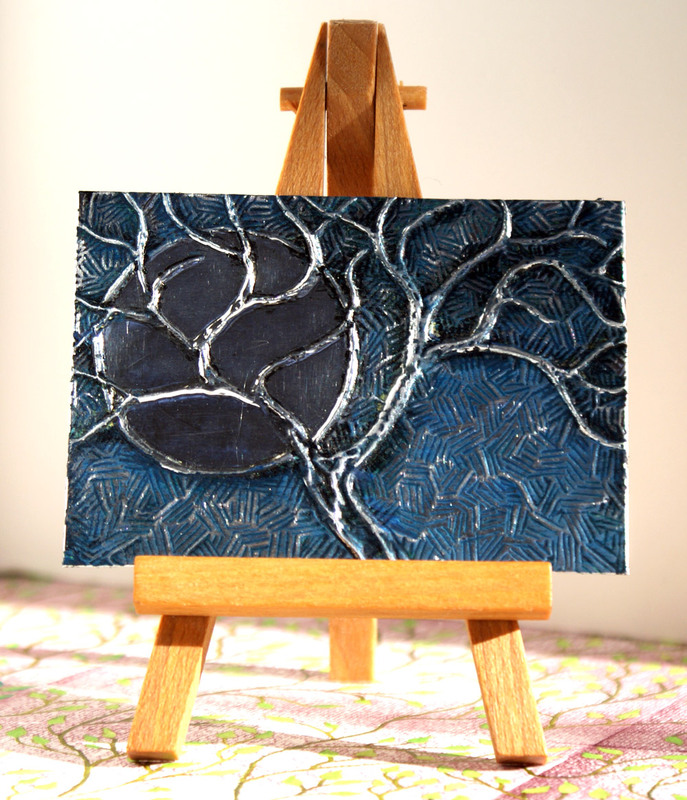 This ACEO was done very much like the instructions above, and painted with copper acrylic paint. 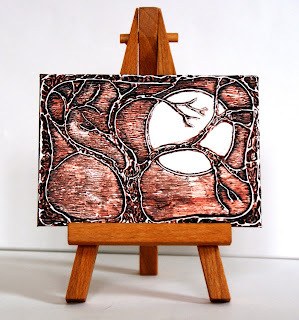 The background of this ACEO is very different (and a lot of work :) ). 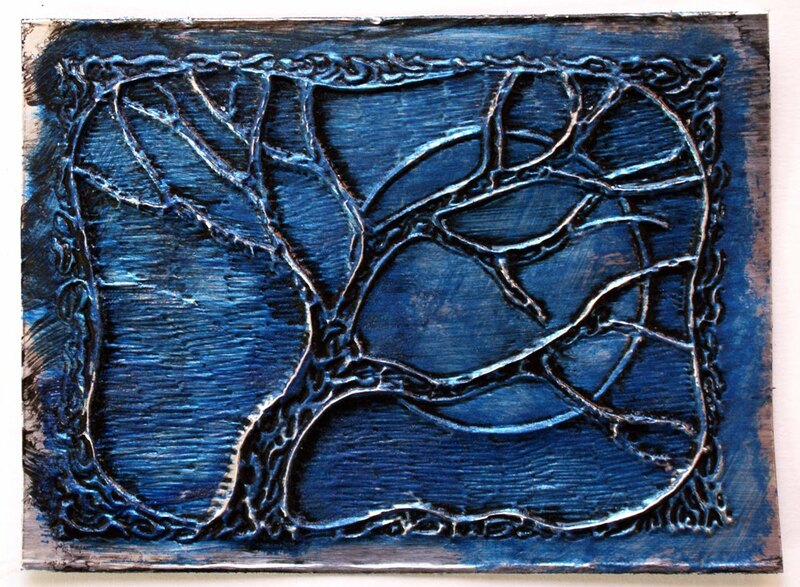 It was painted with blue acrylic paint. These are beautiful Marta! Thank you so much for the tutorial! Wow thanks Marta! I really want to try this, need to find a piece of foam first. I've had the tape for a while, just never got around to embossing. your ACEOs turn out so lovely! Really cool. I love to see how you create your beautiful works of art. Thank you for this! Great instructions! Thanks for sharing them. The pictures are really good, too. Lovely artwork and a very creative idea! Amazing and a lot of work. I had no idea. Your work is lovely. Very interesting presentation and very well done. Thank you all so much for the wonderful comments. I'm so glad you like it! Kathryn, I find the metal tape in the hardware store (believe it or not); it is for auto or household repairs. I have also gotten small sheets (with the adhesive back)and sheets in rolls (no adhesive) from art and craft shops. Email me if you want more information and I will look for links so you can see what they look like. I hope this helps. 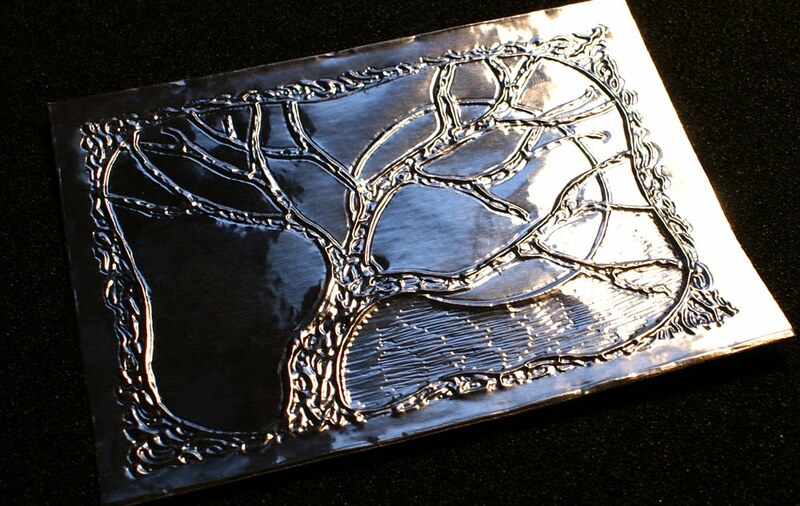 Wow Marta, your work is just gorgeous. I am amazed by how much work and detail you put into something so small. Thanks for showing the process. 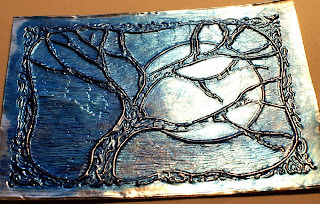 I found your blog by searching "embossed aceo" on etsy and wanted to say thanks for posting this tutorial -- I can't wait to give this a try. Your work is brilliant!! 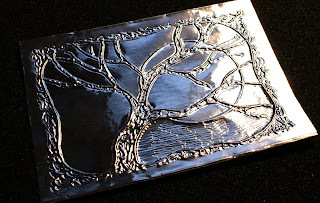 your instructions are great and you make it looks so easy to make a beautiful work of art! How fun! 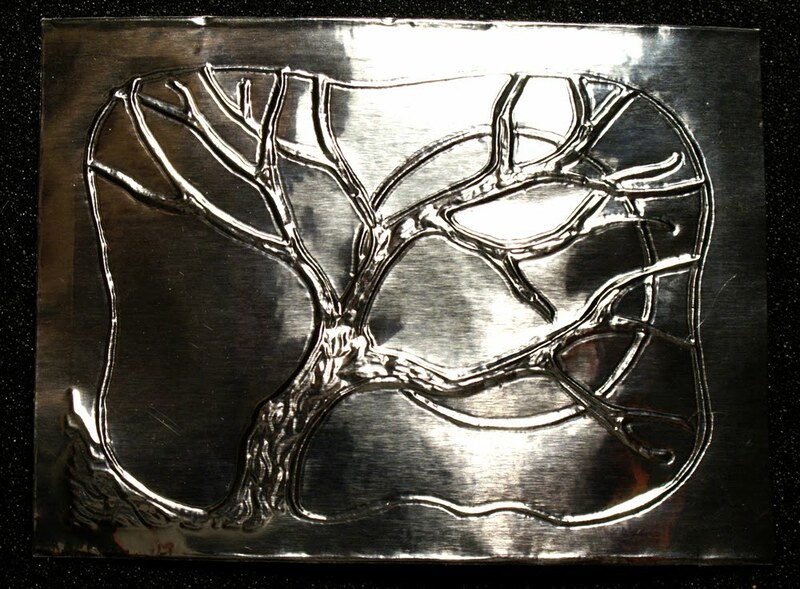 This is a sophisticated version of a project I did with sharpies and tin foil in grade school. Wow! These are wonderful little pieces of art, Marta. Thank you so much for the instructions, too. Thank you, everyone!!! You are all so kind and wonderful in your comments! I really, really appreciate them! Sure! I have included step by step instructions with pictures, but please let me know if something is not clear, and I will try to explain better or demonstrate. 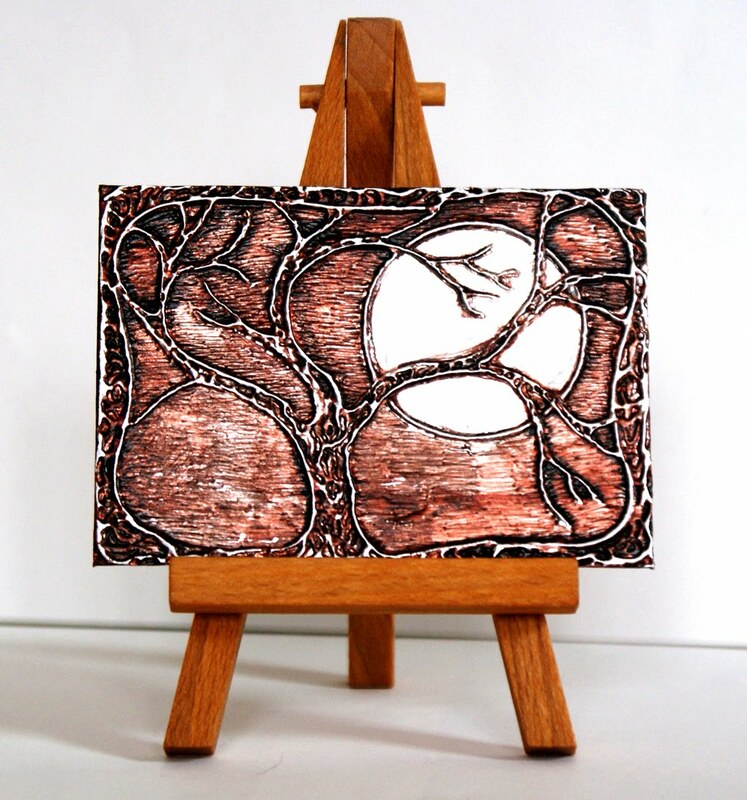 ACEO stands for Art Cards, Editions and Originals. 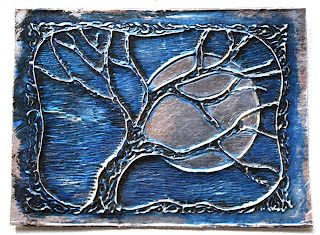 These are a version of the Artist Trading Card (ATC) 2.5 x 3.5 inches but they can be sold by artists. ACEOs allow a lot of people to collect these little works of art, otherwise you would have to be an artist to be able to trade for it :). I hope this helps.